Welcome to the official discussion thread for Super Mario Maker on the Wii U! To start, please add this game to your log, add it to your collection (if applicable), and (when you are ready) rate it using the link above! Super Mario Maker is a new title from Nintendo where, for the first time ever, you will be able to create your own levels on your own console. The game released on September 11th, 2015. Through Nintendo Directs, Nintendo Treehouse videos, and the Super Mario Maker website, there's quite a bit of information out now which is really showcasing how deep the creation tools are. Four Main Themes To Choose From! What's really incredible is the slew of classic objects found inside. When an item wasn't part of a previous or later game theme, Nintendo has taken the time to make new sprites to allow you to always be able to switch on the fly from theme to theme. Some classic objects include, Goombas, Monty Moles, Invisible Blocks, Flagpoles, and so much more! The man who was alongside Miyamoto all these years with the Super Mario series, Takashi Tezuka, is the producer of this game. Koji Kondo, acclaimed Nintendo-music composer, is again the lead composer of this game. I can't imagine we'll see much, if any, new music but it's great that any new renditions of classic themes will be handled by the father of it all. I am looking to collect data on Negative World's levels we create so if you post a level in the thread, I would sincerely and greatly appreciate if you filled out this brief survey about it so the submissions will be collected and we can ensure that your levels are played for a long time to come as part of the Negative World collection. To view the levels, simply click on the link above the survey. Thank you for participating and have fun playing Super Mario Maker! Though I linked to it in the OP, I just watched this video today at lunch and it's once again more awesomeness! I am ridiculously hyped for this game! It really looks like they're putting a 5-star effort into this one. Makes sense to me though... I can't imagine they'd make a Mario game that doesn't live up to the pedigree. A few things are concerning and are mentioned in the video such as the previous cap on level uploading. Lets hope Nintendo gets this right and allows us the freedom to upload as many as we want.... oh and added voice chat. I'm very excited for Mario Maker! What's all this about a level cap, though...? Hopefully it's not too restrictive. They talk about it in the GameXplain video. I guess at some showing in the past year a counter, up to 10, was seen and it implied a max of 10 levels could be shared at a time. This has since disappeared so they hope there is no cap. Also apparently at one time a bar, a la Super Smash Bros., would fill up as you added items to a level. Now that bar is gone so hopefully there is no cap on what you can put in a level, particularly how much. Some examples I've seen are so elaborately wonderful that I'd hate if any ounce of creativeness was squandered somehow. I'm quite hyped and become moreso the more I learn about the game. I'm super hyped for this game, Mario, with endless content, literally endless. So good. I can't wait to design some levels too! I'm really looking forward to it. It should be a lot of fun with my family. It'd be really neat for them to keep adding more objects post-launch too. I don't think they have announced a price, but I'm expecting it to cost a full $60. It should provide enough entertainment to be more than worth that so long as they get the level sharing system right. Oof. I'm hoping more along $30. I will pass if it's 50 or 60 bucks. That would definitely be nice. I can see how $60 seems high to a lot of people if it just feels like a simple level creator at the end of the day, but maybe the overall package will include more content? A bunch of crazy, fun Nintendo created levels would be a nice start, of course. I think a lot of the perceived value is going to depend on how well of a job they do on the level sharing/rating system and social aspects of it all, as well as just how much we can do with the level creation... or world creation? What we saw at last E3 was definitely too sparse to justify a full retail price, but hopefully it will feel much more robust when it's released, and maybe they can even continue to improve it in the future. If the end product has us playing a non-stop supply of fun Mario levels, then I personally feel like I'll get more than $60 worth of entertainment from it. I wonder how such a scenario would affect the future of the series. I think I'm underselling my excitement. Whenever I really stop and think about this game I get pretty hyped. I'll be rockin the Mario 1 and 3 styles pretty hard. The other 2 are more dull in comparison IMO. I get excited when I think about the potential, like levels by game designers. Like, imagine if Miyamoto himself designed some levels in the game, either at release or post release. Levels by Sakurai. That'd be really cool. I also wonder what else the game has. I wonder if music will be a part of it at all. The game has a Mario Paint influence, and I think the same music over and over again could get dull quick. A music designer section with sound channels from all Mario games would be awesome, but I'm probably dreaming. It'd be a very nice addition though. I think he's referring to a player-created Super Mario World level where Mario walks through a goal post that is designed to be a trap. 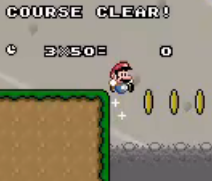 As Mario walks to the victory music, he will fall off of a platform and into a pitfall. I can't remember where I've seen this, though. I still feel like were waiting for this game to come out of it's shell since there hasn't been a lot of info since last E3, but I'm looking forward to it. The Mario Paint-like personality of Mario Maker adds some silliness to the presentation, and I think this could be a fun community-driven game with good longevity. In addition to user-created content, it would be awesome if Nintendo consistently released levels, too. The old Kaizo trap. Yeah, I've been wondering myself if that'll be possible! That's pretty funny. Unfortunately I don't know if we have any confirmation of other goals besides the flagpole. Despite the fact the Flagpole is only used in the first and fourth of the games used as templates/themes, I swore we've seen them use flagpoles for other themes but I guess I could be wrong... maybe I just heard it. That'd be really cool if they had end-level gates, flagpoles, and curtains/stage but re-done for whichever themes it wasn't in prior. It'd be a nice touch. I too am curious how they'll Mario-Paint-ify it up. They use some similar things to mesh the two together a bit. Borrowing icons and such. A friggin' Music composer would be EPIC BEYOND BELIEF. Not that I'd be great at it but it would just blow the world away to have such a comprehensive package in one disc. I'm guessing the game will have a set of Nintendo designed levels that show off what you can do. Maybe not as many as your average New Super Mario Bros. game, but if there's a decent amount, might that change your mind? So most of us appear to be pretty happy about how this game is shaping up... I don't suspect that the $60 price tag should be much of an issue for many now? Every time we have seen this game, it has blown away the previous footage. There are only a couple months of development time left, so do you all think we have now mostly seen what the final retail copy will look like, or do you suspect that they will add in even more content by then? Though the project has already crushed my initial expectations, there is still even more possibility. Play any 2D Mario game right now and you will see objects, enemies, and gameplay elements that are not yet possible in Super Mario Maker. Of course, the tool is robust enough now to make endless fun levels, and they have to save some stuff for sequels. Perhaps even future expansions for this version are in the cards. There could also be a tab where your console friends can send specific boards to you where you can edit or play them. We could have a Negative World board where multiple users sign up to help edit it. One user would have a go at it and pass it onto the next person in the list. Once done we'd share our playbacks. A Mario 2 pack in the future would be pretty amazing. Someone should probably fix the title. I know they've said you can sort by difficulty, creator, "up and coming", and levels featured by Nintendo. There's also a clear rate so you know how many people have been able to beat it.